Channel 37: Serial Science Fiction from the Distant Reaches of UHF!
. . . to your home for serial science fiction from the distant reaches of UHF: Channel 37! 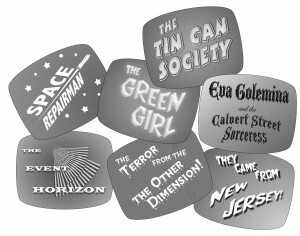 In the days before cable, science fiction fans across the country tuned in their favorite UHF stations to watch an endless parade of clunky tinfoil robots, rubber-suit monster menaces, spaceships dangling on strings, and quippy jut-jawed heroes battling it out in front of smoke-filled cardboard sets accompanied by Theremin music. On Channel 37, those days live on! We offer serial adventures, anthology tales, and feature film-length stories in handy blog form for your episodic delectation. Pull up a comfortable chair, make sure your tongue is planted firmly in your cheek, and relive with us those exciting days of yesteryear, when television was the black-and-white portal to the universe! Audio Invasion: Episode 30 – NostalgiCon Live! Episode 26 – Science Marches On! Audio Invasion Episode 25: The Banality of Triumph!